If your house lacking interest either in the front or in the back? This couple felt they needed something in their backyard. Their sliding glass doors opened up to a plain old boring concrete slab. They were looking for a place to site, relax, and enjoy their beautiful backyard. Knutson Custom built them a 2 tier deck that allowed them ample sitting areas for when it was just the two of them or if they had company over. 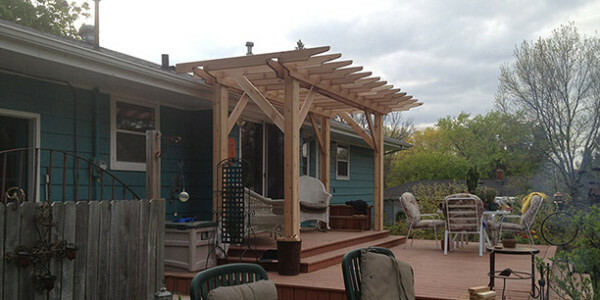 Because of the direction of their backyard they got a lot of sun (all day), so Knutson built them a pergola to provide some shade. The pergola not only provides shade during the day it also provides visual interest at night as it is outlined with rope lighting.